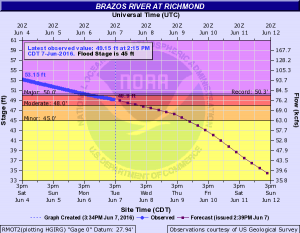 The most recent forecast for Richmond continues to show the Brazos receding from a peak elevation of 54.81’. The most recent observation is 49.15’ at 2:15pm indicating a drop of approximately 5’. 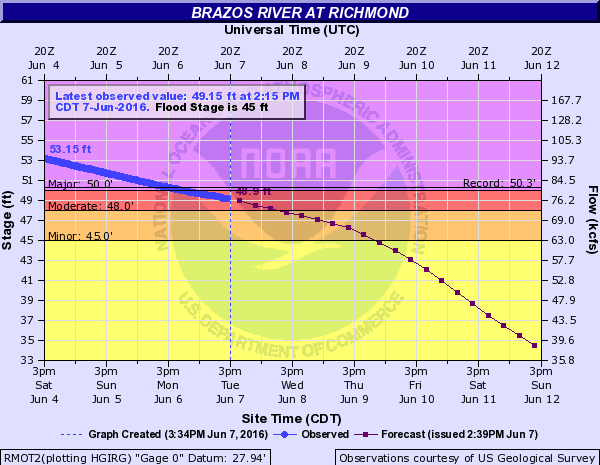 The Brazos River at Richmond is now below NWS major flood level and the current forecast calls for it to be below minor flood level early Friday morning. For reference, the River has been elevation 30’+ since mid-April.